A mystery Latin American country; Miami Beach, Florida, USA; London, UK; Unnamed airport, UK; Golf course in Southend-on-Sea, Essex, UK; Nr. Geneva, Switzerland; 35,000ft above Newfoundland; Friendship Airport, Baltimore, USA; Auric Stud, Kentucky, USA; Fort Knox, Kentucky, USA; Washington, USA. Bond swims towards an oil refinery and plants explosives inside a secret drugs lab. He sheds his wetsuit to reveal a white tuxedo perfect for the night ahead in a club. The explosions start as 007 makes his way over to an associate; the night is just beginning. Whilst meeting a flamenco dancer Bond sees an assailant reflected in her eyes. A fight ensues, and there can be only one winner. The assailant is quickly thrown into a bath of water where he scrabbles for Bond's gun. Bond reaches for an electric heater, which he throws into the water to electrocute the man and quips, "shocking, positively shocking". As with the first film in the series, the title is that of Ian Fleming's novel, and is taken from the name of the central villain. 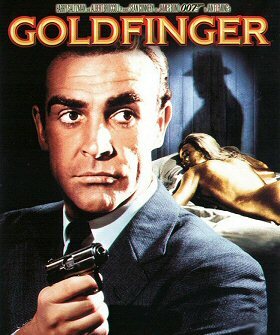 Through his binoculars Bond watches Goldfinger break a pencil; from a great distance he hears the snap. The Aston Martin DB5 makes its debut, with rotating licence plates, water jets, smoke screen, radar and ejector seat. A scene where Bond passes by a Royal Mail van in Q-Branch which quickly transforms into a sniper platform and machine gun turret was cut, but can be seen projected on the dances in the title sequence. The atomic clock in Fort Knox was originally cut to end at 003, but it was later changed to stop on 007, hence the continuity error of the line "three more ticks".